Robert Fulton (1765–1815) was an American engineer and inventor who is widely known for developing a commercially successful steamboat called Clermont. In 1807, that steamboat took passengers from New York City to Albany and back again, a round trip of 300 miles, in 62 hours. Fulton's experiments began while he was in Paris, and may have been stimulated by his acquaintance with Chancellor Livingston, who held the monopoly, offered by the legislature of the State of New York, for the navigation of the Hudson River. Livingston was now the ambassador of the United States to the Court of France and had become interested in Fulton, meeting him, presumably, at a friend's house. It was determined to try the experiment at once and on the Seine. "A sort of mania began to prevail" for propelling boats by means of steam-engines. Fulton was one of those taking this mania most seriously. He made a number of models which worked successfully and justified the proprietors of the new arrangement in building on a larger scale. A model of the proposed steamboat was made during the year 1802, and was presented to the committee of the French legislature..."
With the encouragement of Livingston, who urged upon Fulton the importance of the introduction of steam navigation into their native country, the latter continued his experimental work. Their boat was finished and set afloat on the Seine in 1803, in the early spring. Its proportions had been determined by careful computation from the results of no less careful experiment on the resistance of fluids and the power required for propelling vessels; and its speed was, therefore, more nearly in accord with the expectations and promises of the inventor than was the usual experience in those days. Guided by these experiments and calculations, therefore, Fulton directed the construction of his steamboat vessel. The hull was 66 feet long, of 8 feet beam, and of light draught. But unfortunately the hull was too weak for its machinery, and it broke in two and sank to the bottom of the Seine. Fulton at once set about repairing damages. He was compelled to direct the rebuilding of the hull, but the machinery was but slightly injured. In June 1803, the reconstruction was complete, and the vessel was set afloat in July. On August 9, 1803, this steamboat was cast loose in front of an immense crowd of spectators. The steamboat moved slowly, making only between three and four miles an hour against the current, the speed through the water was about 4.5 miles; but this was, all things considered, a great success. The experiment attracted little attention, notwithstanding the fact that its success had been witnessed by the committee of the National Academy and by officers on Napolean Bonaparte's staff. The boat remained a long time on the Seine, near the palace. The water-tube boiler of this vessel is still preserved at the Conservatoire des Arts et Metiers at Paris, where it is known as Barlow's boiler. Livingston wrote home, describing the trial and its results, and procured the passage of an Act by the legislature of the State of New York, extending, nominally to Fulton, a monopoly granted the former in 1798 for the term of 20 years from April 5, 1803 - the date of the new law - and extending the time allowed for proving the practicability of driving a boat 4 miles an hour by steam to two years from the same date. A later act further extended the time to April 1807. In May 1804, Fulton went to England, giving up all hope of success in France with either his steamboats, and the chapter of his work in Europe practically ends here. He had already written to Boulton & Watt, ordering an engine to be built from plans which he furnished them; but he had not informed them of the purpose to which it was to be applied. This engine was to have a steam cylinder two feet in diameter and of four feet stroke. Its form and proportions were substantially those of the boat engine of 1803. Meantime, the opening of the century had been distinguished by the beginning of work in the same direction by the most active and energetic among Fulton's later rivals. This was Col. John Stevens of Hoboken, who, assisted by his son, Robert L. Stevens, was earnestly engaged in the attempt to seize the prize now so evidently almost within the grasp. This younger Stevens was he of whom the great naval architect and engineer, John Scott Russell, afterward remarked: "He is probably the man to whom, of all others, America owes the greatest share of its present highly improved steam navigation." 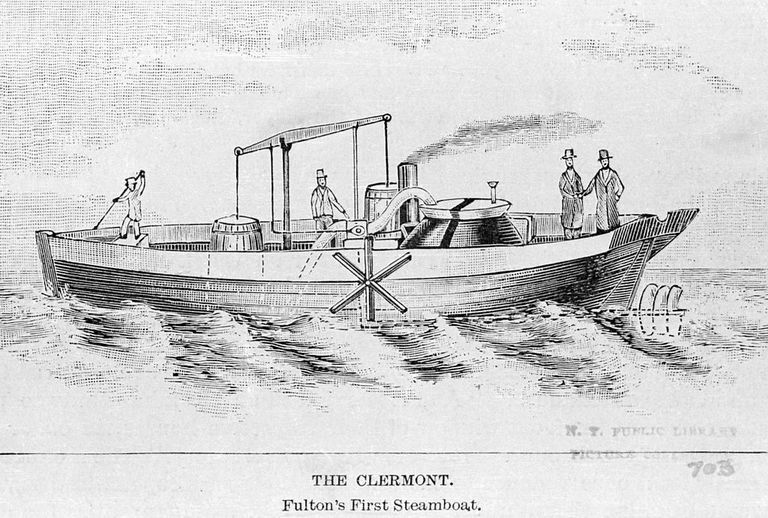 The father and son worked together for years after Fulton had demonstrated the possibility of reaching the desired end, in the improvement of the hulls and machinery of the river steamboat, until in their hands, and especially in those of the son, the now familiar system of construction in all its essentials was developed. The elder Stevens, as early as 1789, evidently had seen what was in prospect, and had petitioned the legislature of the State of New York for a grant similar to that actually accorded Livingston, later; and he had certainly, at that time, formed plans for the application of steam power to navigation. The records show that he was at work on construction as early, at least, as 1791. In 1804, Stevens completed a steamboat 68 feet long and of 14 feet beam. Its boiler was of the water-tubular variety. It contained 100 tubes, 3 inches in diameter and 18 inches long, fastened at one end to a central water leg and steam-drum. The flames from the furnace passed among the tubes, the water being inside. The engine was direct-acting high-pressure condensing, having a 10-inch cylinder, two feet stroke of the piston, and driving a well-shaped screw, with four blades. This machinery - the high-pressure condensing engine, with rotating valves, and twin screw propellers - as rebuilt in 1805, is still preserved. The hub and blade of a single screw, also used with the same machinery in 1804, is likewise extant. Stevens' eldest son, John Cox Stevens, was in Great Britain in the year 1805, and while there patented a modification of this sectional boiler. While Fulton was still abroad, John Fitch and Oliver Evans were pursuing a similar course of the experiment, as were his contemporaries on the other side the Atlantic, and with more success. Fitch had made a number of fairly successful ventures and had shown beyond question that the project of applying steam to ship propulsion was a promising one, and he had only failed through lack of financial backing, and inability to appreciate the amount of power that must be employed to give his boats any considerable speed. Evans had made his "Oruktor Amphibolis" - a flat-bottomed vessel which he built at his works in Philadelphia - and impelled by its own engines, on wheels, to the bank of the Schuylkill, and then afloat, down the stream to its berth, by paddle-wheels driven by the same engines. Other inventors were working on both sides the ocean with apparently good reason to hope for success, and the times evidently were ripe for the man who should best combine all the requirements in a single experiment. The man to do this was Fulton. Immediately on his arrival, in the winter of 1806-7, Fulton started on his boat, selecting Charles Brown as the builder, a well-known ship-builder of that time, and the builder of many of Fulton's later steam-vessels. The hull of this steamer, which was the first to establish a regular route and regular transportation of passengers and merchandise in America, - Fulton's first boat in his native country, - was 133 feet long, 18 feet beam, and 7 feet depth of hold. The engine was of 24 inches diameter of the cylinder, 4 feet stroke of the piston; and its boiler was 20 feet long, 7 feet high, and 8 feet wide. The tonnage was computed at 160. After its first season, its operation having satisfied all concerned of the promise of the venture, its hull was lengthened to 140 feet, and widened to 16.5 feet, thus being completely rebuilt; while its engines were altered in a number of details, Fulton furnishing the drawings for the alterations. Two more boats, the "Raritan" and the "Car of Neptune" were added to form the fleet of 1807, and steam navigation was at last fairly begun in America, some years in advance of its establishment in Europe. The Legislature were so much impressed with this result that they promptly extended the monopoly previously given Fulton and Livingston, adding five years for every boat to be built and set in operation, up to a maximum not to exceed a total of thirty years. I left New York on Monday at one o'clock, and arrived at Clermont, the seat of Chancellor Livingston, at one o'clock on Tuesday time, twenty-four hours; distance, one hundred and ten miles. On Wednesday I departed from the Chancellor's at nine in the morning, and arrived at Albany at five in the afternoon: distance, forty miles; time, eight hours. The sum is one hundred and fifty miles in thirty-two hours, - equal to near five miles an hour. On Thursday, at nine o'clock in the morning, I left Albany, and arrived at the Chancellor's at six in the evening. I started from thence at seven, and arrived at New York at four in the afternoon: time, thirty hours; space run through, one hundred and fifty miles, equal to five miles an hour. Throughout my whole way, both going and returning, the wind was ahead. No advantage could be derived from my sails. The whole has therefore been performed by the power of the steamengines. I am, Sir your obedient servant - Robert Fulton"
The last boat which was constructed under Fulton's directions, and according to drawings and plans furnished by him, is that which, in 1816, navigated the sound from New York to New Haven. She was nearly 400 tons, built of uncommon strength, and fitted up with all conveniences and great elegance. She was the first steamboat with a round bottom like a sea-going ship. This form was adopted, because, for a great part of the route, she would be as much exposed as on the ocean. It was, therefore, necessary, to make her a good sea boat. She passed daily, and at all times of the tide, the then dangerous strait of Hell Gate where, for a mile, she frequently encountered a current running at the rate of 5 or 6 miles an hour. For some distance, she had within a few yards, on each side, rocks, and whirlpools which rivaled Scylla and Charybdis, even as they are poetically described. This passage, previously to its being navigated by this steamer, was supposed to be impassable except at the change of the tide; and many shipwrecks had been occasioned by a mistake in time. "The boat passing through these whirlpools with rapidity, while the angry waters foamed against her bows, and appeared to raise themselves in obstinate resistance to her passage, is a proud triumph of human ingenuity. The owners, as the highest tribute they had in their power to offer to his genius, and as an evidence of the gratitude they owed him, called her the "Fulton." A steam ferry-boat was built to ply between New York and Jersey City in 1812, and the next year two others, to connect with Brooklyn. These were "twin boats" the two hulls being connected by a "bridge" or deck common to both. The Jersey ferry was crossed in fifteen minutes, the distance was a mile and a half. Fulton's boat carried, at one load, eight carriages, and about thirty horses, and still had room for three hundred or four hundred foot passengers. "She is built of two boats, each ten feet beam, eighty feet long, and five feet deep in the hold; which boats are distant from each often ten feet, confined by strong transverse beam knees and diagonal traces, forming a deck thirty feet wide and eighty feet long. The propelling water-wheel is placed between the boats to prevent it from injury from ice and shocks on entering or approaching the dock. The whole of the machinery being placed between the two boats, leaves ten feet on the deck of each boat for carriages, horses and cattle, etc. ; the other, having neat benches and covered with an awning, is for passengers, and there is also a passage and stairway to a neat cabin, which is fifty feet long and five feet clear from the floor to the beams, furnished with benches, and provided with a stove in winter. Although the two boats and space between them gives thirty feet beam, yet they present sharp bows to the water, and have only the resistance in the water of one boat of twenty beam. Both ends being alike, and each having a rudder, she never puts about." Meantime, the War of 1812 was in progress, and Fulton designed a steam vessel-of-war, which was then considered a wonderfully formidable craft. Fulton proposed to build a vessel capable of carrying a heavy battery, and of steaming four miles an hour. The ship was fitted with furnaces for red-hot shot, and some of her guns were to be discharged below the water-line. The estimated cost was $320,000. The construction of the vessel was authorized by Congress in March 1814; the keel was laid June 20, 1814, and the vessel was launched October 29 of the same year. The "Fulton the First," as she was called, was then considered an enormous vessel. The hull was double, 156 feet long, 56 feet wide, and 20 feet deep, measuring 2,475 tons. In May the ship was ready for her engine, and in July was so far completed as to steam, on a trial trip, to the ocean at Sandy Hook and back, 53 miles, in eight hours and twenty minutes. In September, with armament and stores on board, the ship made for sea and for battle; the same route was traversed, the vessel making 5.5 miles an hour. Her engine, having a steam cylinder 48 inches in diameter and of 5 feet stroke of piston, was furnished with steam by a copper boiler 22 feet long, 12 feet wide, and 8 feet high, and turned a wheel, between the two halls, 16 feet in diameter, with "buckets" 14 feet long, and a dip of 4 feet. The sides were 4 feet 10 inches thick, and her sporadic was surrounded by musket proof bulwarks. The armament consisted of 30 32-pounders, intended to discharge red-hot shot. There was one mast for each hull, fitted with lateen sails. Large pumps were carried, intended to throw streams of water on the decks of the enemy, with a view to disabling him by wetting his ordnance and ammunition. A submarine gun was to have been carried at each bow, to discharge shot weighing one hundred pounds, at a depth of ten feet below water. This, for the time, tremendous engine-of-war was constructed in response to a demand from the citizens of New York for a means of harbor defense. They appointed what was called a Coast and Harbor Defense Committee, and this committee examined Fulton's plans and called the attention of the General Government to them. The Government appointed a Board of Experts from among its most famous naval officers, including Commodore Decatur, Captains Paul Jones, Evans, and Biddle, Commodore Perry; and Captains Warrington and Lewis. They reported unanimously in favor of the proposed construction and set forth her advantages over all previously known forms of war vessels. The citizens' committee offered to guarantee the expense of building the ship; and the construction was undertaken under the supervision of a committee appointed for the purpose, consisting of several then distinguished men, both military and naval. Congress authorized the building of coastal defense vessels by the President, in March 1814, and Fulton at once started the work of construction, Messrs.
Adam and Noah Brown building the hull, and the engines being placed on-board and in working order within a year. The death of Fulton took place in the year 1815, while at the height of his fame and of his usefulness. He had been called to Trenton, New Jersey, in January of that year, to give testimony before the State legislature in reference to the proposed repeal of laws which had interfered with the operation of the ferry-boats and other steam-vessels plying between the city of New York and the New Jersey shore. It happened that the weather was cold, he was exposed to its severity both at Trenton and, especially, crossing the Hudson River on his return, and took a cold from which he never recovered. He became apparently convalescent after a few days; but insisted on visiting the new steam frigate too soon, to inspect work in progress there, and on his return home experienced a relapse, - his illness finally resulting in his death, February 24, 1815. He left a wife (nee Harriet Livingston) and four children, three of whom were daughters. Fulton died in the service of the United States government; and although engaged for years in devoting time and talents to the best interests of our country, still the public records show that the Government was indebted to his estate upwards of $100,000 for money actually expended and services rendered by him, agreeably to contract. When the legislature, then in session at Albany, heard of the death of Fulton, they expressed their sentiments of regret by resolving that the members of both houses should wear mourning for six weeks. This is the only instance, up to that time, of such public testimonials of regret, esteem, and respect being offered on the death of a private citizen, who was only distinguished by his virtues, his genius, and his talents. He was buried February 25, 1815. His funeral was attended by all the officers of the National and State governments in the city at the time, by the magistracy, the common council, a number of societies, and a greater number of citizens than had ever been collected on any similar occasion. When the procession began to move, and until it arrived at Trinity Church, minute-guns were fired from the steam frigate and the Battery. His body is deposited in a vault belonging to the Livingston family. In all his social relations he was kind, generous, and affectionate. His only use for money was to make it an aid to charity, hospitality, and the promotion of science. He was especially distinguished by constancy, industry, and that union of patience and persistence which overcame every difficulty.